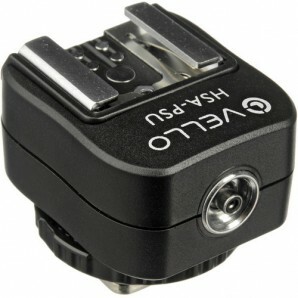 Vello's Universal Hot Shoe Adapter - PC Connection + Top Shoe allows you to add a PC connection to any camera that does not come with a built-in PC sync connection (excluding Sony cameras with Multi Interface Shoe, or older cameras with Sony/Minolta type shoe), while still retaining the existing hot shoe functionality. 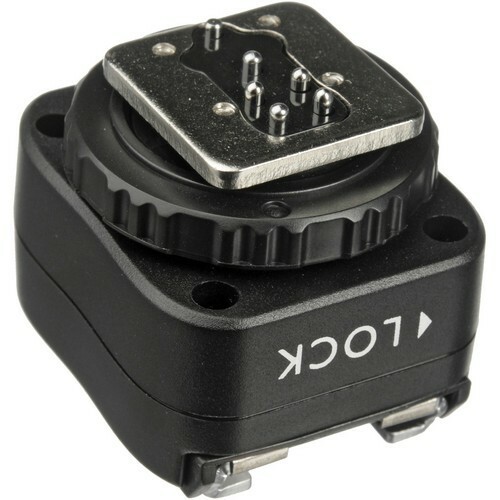 This adapter fits into any standard hot shoe and adds a PC sync connection to your camera, allowing you to connect to a studio flash using the PC connection. In addition, the adapter also features a hot shoe on top (non-TTL), which allows you to keep a flash mounted on the camera (or any other shoe accessory) while simultaneously connecting the camera to a studio light via a PC sync cord. Or, use it to provide a PC connection to a flash, when positioned off-camera. This adapter does not support TTL flash operation. This adapter does not provide high-voltage sync protection, and is not recommended for use with flash units that have a trigger voltage of more than 6V. Box Dimensions (LxWxH) 2.4 x 1.6 x 1.4"
All my equipment is now compatible! I am so glad I found this product. I have speedlights and flash units that, with this adapter, work perfectly. They don't have a sync connection but this adapter does the trick. In terms of equipement that I now don't have to rebuy and so many quality models of older equipment I can buy now that I have an adapter this baby is going to save me a ton! The metal is good construction and I expect it to last a while. Of course, being able to add a flash is a nice bonus!